In college you will be interacting with a lot of people – other students mostly of course. Like all students, TALK students may find that from time to time they may become ill or have tummy upsets. This is due to exposure to many different bacteria that, when ingested, can cause problems with your health in a mild or even a major way. A good way to prevent or to combat these harmful bacteria is to use a hand sanitizer. Hand sanitizers are available in small and compact sizes that allow you to keep them handy and in your bag so that you can use them whenever you think necessary. 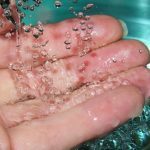 Here are some of the places that are full of bacteria and germs and that you may want to wash your hands after you have touched them, and before you do something like pick up an item of food to eat. Door Knobs – When you touch door knobs, especially those on the restroom doors, it is important to always wash or sanitize your hands before you head off to eat a meal or snack. Many students touch door knobs each and every day, and sometimes, some students may not wash their hands after using the restrooms. This is one of the major ways that bugs are ingested and result in stomach-related illnesses. Computer Keyboards – Computer keyboards are another place where bacteria are present. Computer labs see hundreds of students at its desks each year. As you no doubt have noticed these computer keyboards are often covered in sweat, or food particles and what you don’t always see – bacteria. Classroom Desks – Classroom desks are another place where bacteria thrives, and classroom desks see many students all year round – with that much exposure there is sure to be some type of bacteria present on their surfaces. Always clean your hands after you have finished your classes for the day to reduce the risk of catching any illnesses and spreading it as well.